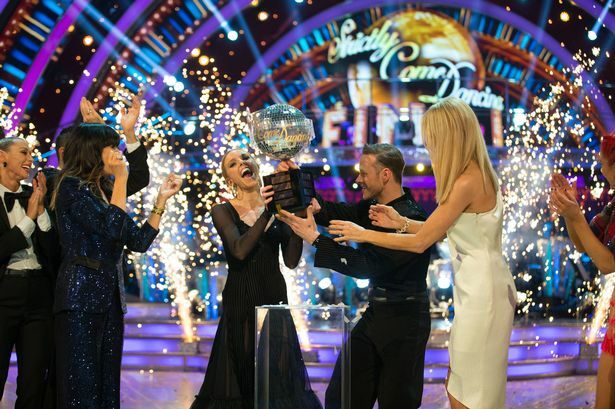 This Way Up : My Favourite TV Show of 2018- Strictly Come Dancing! I do remember seeing snippets of the original Come Dancing which was a very stilted sort of show that made little concession to the television cameras. It was as if the BBC could only film an event that would have happened anyway. 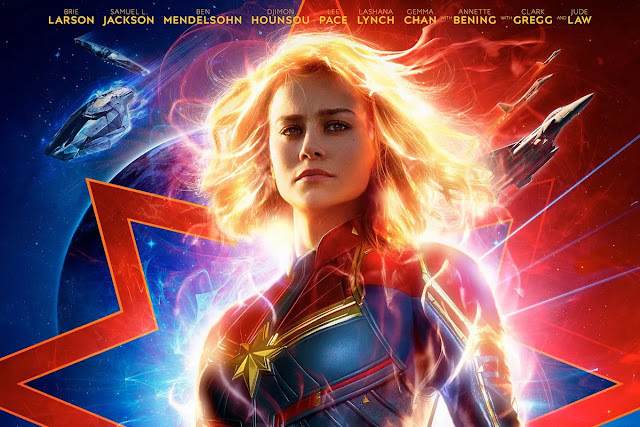 Strictly (as everyone calls it to the point where there are probably some people who don’t know the title has two other words in it) on the other hand was forged by television. The title is actually totally inaccurate as there is nothing `strictly` about it. Despite occasional grouching from the judges, the `strict` rules of ballroom and Latin are stretched, bent, flouted and broken constantly in the name of entertainment. Which is how it should be. Strictly instead is the final bolt hole of tv showbiz. It may have the choreography of a reality show- viewer votes, dance offs – yet it is still a showbiz show and you can’t say that about the gravel eating on I’m A Celebrity. 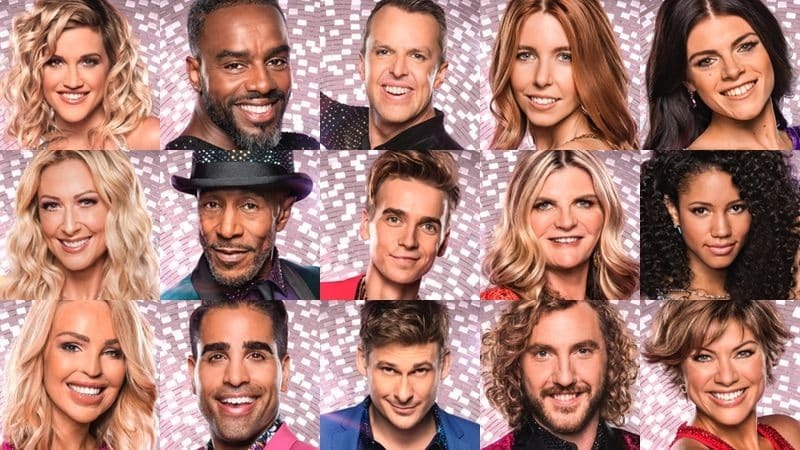 Even if you’ve never watched the show you’ll know the phrase “my Strictly journey” which sounds a bit like “My X Factor journey” except that what happens in this competition is not supposed to be the life changing event that the rival show is for the contestants. Because the people who do Strictly are already famous, at least in one media constituency, whether they master the Paso Doble is not actually going to make that much difference when it comes to hosting the Breakfast show or propping up the bar at the Queen Vic. So why is this journey more compelling than the one which really will change someone’s life? It may be this. Way back when Madonna sang “Only when I’m dancing can I feel this free” what she meant could be applied to so many of the people who’ve been on their Strictly journey. Somehow learning bizarrely named dances at a rate of one per week frees these artistic souls in ways they couldn’t have imagined. The other interesting aspect of the show is that it promotes the value of hard work. Glimpses of the training routine that the celebs have to undertake to progress show hours and hours of going through the choreography again and again. You couldn’t be a slacker and get very far in Strictly. You have to work long, disciplined hours each week for almost four months if you want to reach the Final. This is an achievement with a glorious end though, not an endurance for the sake of it. Its so much fun to watch the first show’s group dance when all the celebs totter around like antelopes on ice and then see the final when they are often indistinguishable from the professionals, fluid, interpretive and triumphant, the butterflies ascending! Also it’s a funny show. While the sort of mild but covert innuendo that Bake Off loves is outlawed due to the family timeslot there are often verbal slip ups (especially from judge Bruno Tonioli) and literal ones too. There are sometimes people chosen who are clearly never going to dance but are absolutely determined to do their thang. John Sergeant and Ann Widdicombe we salute you! And who doesn’t like Claudia Winkleman’s deadpan surrealism, one of the most unexpected but delightful aspects of the show. I have to say too that the music of Dave Arch and his band is spot on; he seems able to reproduce any genre from classic musicals to stuff that was a hit last month with impeccable style. Yet he often gives it a little twist- my favourite this year was the extra drum kick at the end of each line of `Nutbush City Limits``. The programme has also generated its own by product, the so called Strictly Curse wherein partnered up or even married celebs fall for their dance partner because dancing is close and intimate and emotional. It’s a bit overstated because the media love that speculation but it has happened and of course it could happen anywhere. This year we had the infamous off stage kiss between Sean Walsh and dance partner Katya Jones though the real romance appears to have been between vlogger Joe Sugg and Diane Buswell. I almost feel like I know these two, as being a vlogger Joe – accompanied by Diane- did weekly updates which go into a lot more detail on the training. If you ever wondered just how much work goes into these routines, you should take a look at the vlogs. This year actually was a bit atypical in some respects as there was no dreadful dancer who ended up at the foot of the judges’ leader board each week only to be voted back by the public. We also had the tentative introduction of `couples choice` wherein they could select from a wider list including street dance and jazz which I’m sure has only happened because Len Goodman is no longer on the judges panel. The fact that it gave us one of the highlights of the series when Charles Venn and Karen Clifton locked, popped and waved handkerchiefs to `Get Up off That Thing` will surely mean it is back next year? That was my favourite dance of the 2018 run (look- I even have a favourite dance!) just ahead of Stacy Dooley and Kevin Clifton’s moving routine to `I Dreamed A Dream`. They won the whole thing in the end which is great because Stace (as I’m sure we have to call her) was a non dancer when it started and the fact that she could pull off such performances after such a relatively short time is astounding. And when they did win, the first person to rush towards them shouting “you did it!” was Kev’s ex-wife who also works on the show. Moments like that cannot be replicated by any drama. So yes, Strictly is my favourite tv programme of this year and I’m quite pleased to reveal that. # Hosts Tess Daly and Claudia Winkleman arrive on stage and attempt the most basic frug before giving up with a showbiz kick. You’d think after all this time on the show they’d be able to throw together at least one dance move! 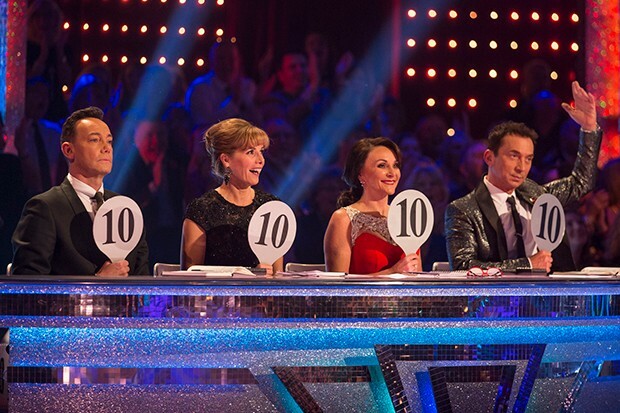 # Bruno Tonioli will not remain in his seat, he will grab the adjacent Shirley as he rhapsodies about the performance. Occasionally he will fall of his chair altogether. This happens more often than you’d think. # Shirley Ballas will comment as if she is a teacher; “I’m pleased with you this week” she often says when not ducking away from Bruno’s flailing exhuberance. # Darcy Bussell will pick on some tiny technical detail to which the celeb will clearly have no clue what she is talking about but they nod anyway. # Craig Revel Horwood will rarely smile and even less frequently award anyone 10. His comments are delivered with deadpan solemnity. # When a clearly poor couple are in the dance off and will obviously be sent home the judges’ sage advice is “just go out and enjoy it”. # The results show on Sundays is still trying to keep up the pretence that it wasn’t filmed on the Saturday. One season they even tried moving the audience round to convince us it was Sunday. # A contestant will often be seen in the pre-dance video looking as if they have no clue about the upcoming dance then will perform it perfectly. # No costume is beyond the superb make up team nor the imagination of the professionals. Memorably this year Stacy and Kevin danced as Minions. # The only dancer to appear in every series, Anton Du Beke, is almost always partnered up with the least capable contestant. # Once a series the show moves to Blackpool which is always described as “the home of ballroom.” A good drinking game for this episode is to take a swig every time someone mentions the springy floor. They do like this blog, those pesky judges.